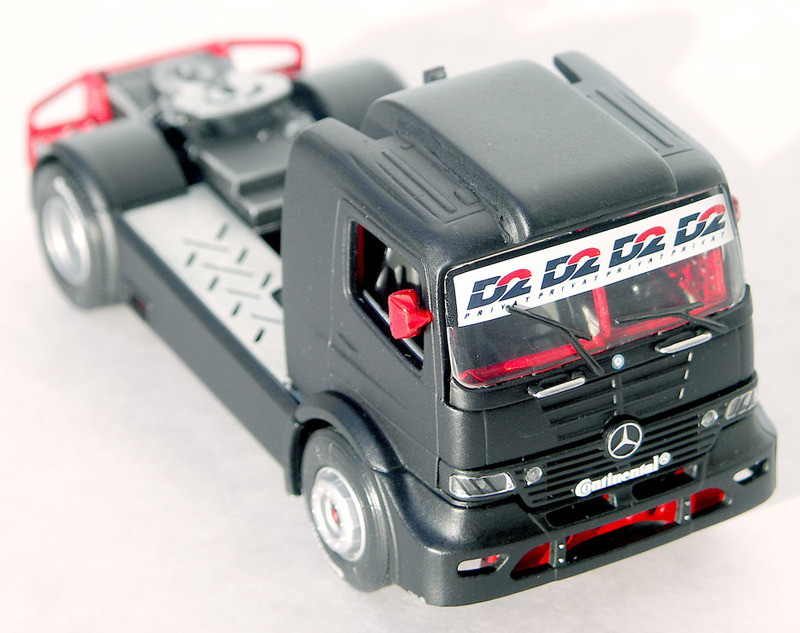 Here is a smart new addition to Corgi’s ever-growing Truckfest range. The 'big cat' graphics decorating the sides of the 1:50 scale Scania tractor unit are extremely well done, and represent the markings of Wayne Catt Transport, a ten-year old UK-based haulage company. 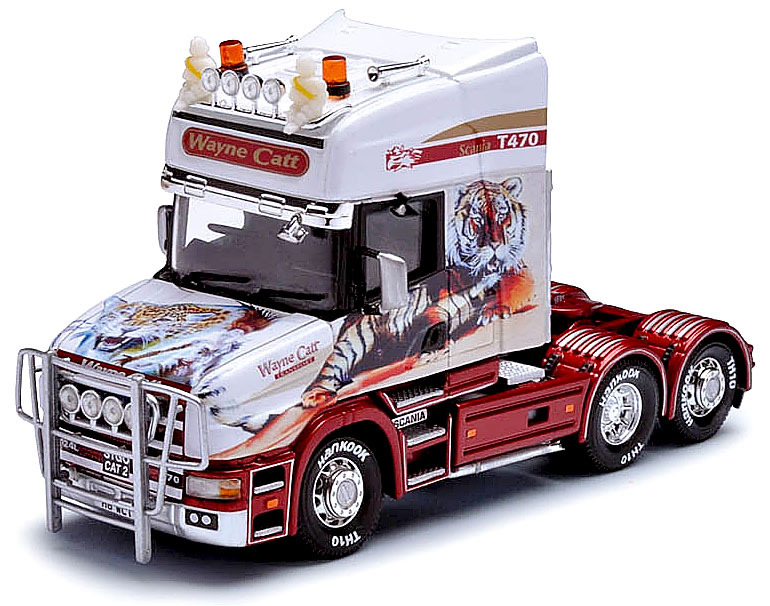 The Wayne Catt Truckfest Scania is covered with photo-realistic vinyl graphics, the full-size equivalent of scale model decals. Vinyl technology means that today it’s possible to have any visual treatment you like on your machine. Once printed on to the thin plastic sheet, the designs can be draped over a vehicle, and with some skill by operatives using hot-air blowers, the vinyl wraps smoothly on and around even the most complex curves. And when it’s time to sell the vehicle, the vinyl can be removed without harming the paintwork underneath. It’s a far cry from the super-talented work of a retired signwriter friend of mine, who spent his working days painting vehicle sides one at a time by hand! Vinyl works on simpler graphics too - I bought a red Micra last year (an insurable option for my just-passed-her-driving-test daughter) and we decided that the somewhat blobular little car looked rather like a ladybird, minus its spots. Sooo... £25.00 GBP ($40.00 USD) later, along came a pack of newly-printed black blobs in assorted sizes. And with no lessons beforehand, she and friends had a ball, vinylizing her car! What’s the Catt truck like? Back to the new Corgi. It’s a 2000-only Limited Edition, well up to the high standard set by others in the Truckfest series, and would look good in your collection. The usual details on the 125 mm (4.9 in) long model are there - rows of lights, a pair of Michelin men, bull bar in front, and a particularly neatly produced set of wheels and tyres, all of which are lettered as the original. Diecasts are usually thought of as exclusively ‘collector’ items, but of course you csn customize them, albeit without as much flexibility as is possible with a plastic kit. However, a simple paint job can give an old model a fresh lease of life, as well as adding some original style to your shelf-top custom parade. The metal shell of the Corgi Mercedes-Benz Actros shown above and below was dipped in paint remover to remove all trace of its former finish, then cleaned thoroughly in warm water. Automotive aerosol spray was used for the new deep-black look: this one is a satin finish, though any decent auto-spares store will sport a galaxy of types, from high-gloss to pearlescent. Plastic components were also cleaned, though don’t try paint remover - you’ll end up with a blob of melted plastic if you do! The finish for these parts was Volkswagen Mars Red, which is a rich, lustrous shade that needs only a couple of coats to look good. Small items were hand painted, and the whole thing reassembled after being left for several days to dry and harden thoroughly. 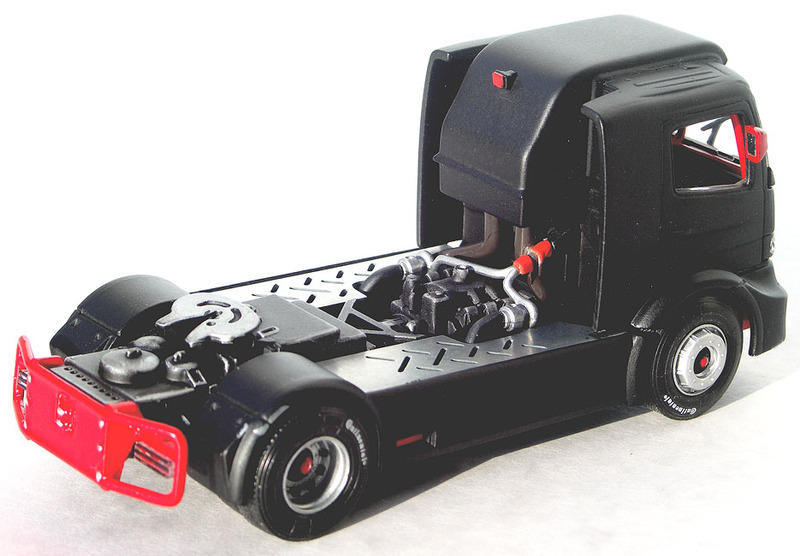 If you like 1:50 scale trucks, the Corgi Truckfest range is among the best. If you want to try a custom refinish for the first time, then it’s best to try it out on a cheaper, used truck - try looking around your next local swapmeet or collector fair for likely items. And of course injection-kit manufacturers such as Revell and Italeri have plenty of choice in their ranges, especially in larger sizes such as 1:25 scale.